The corollary to any human practice or endeavour is the ominous possibility of things going wrong, and this potential risk must be taken into account when considering the promulgation of regulations or the adoption of standards and recommended practices. There was much focus at the 2019 ACI-Pacific/World Annual General Assembly, Conference and Exhibition - which is being held in Hong Kong from 2 to 4 April - on the smart use of information technology (IT) to both streamline the air transport experience and to make it safer. IT helps airlines and airports improve their competitiveness by both improving their efficiency and reducing their operating costs. For the most part, airlines now achieve these objectives by migrating their services to Cloud Computing, which Eric Griffith defines in PCMag as “storing and accessing data and programs over the Internet instead of a computer's hard drive. The cloud is just a metaphor for the Internet. It goes back to the days of flowcharts and presentations that would represent the gigantic server-farm infrastructure of the Internet as nothing but a puffy, white cumulus cloud, accepting connections and doling out information as it floats”. Cloud – which is a buzzword for optimizing services through the IT network – helps airlines in both their connectivity and the improvement of their services to the passengers and other clients they serve. 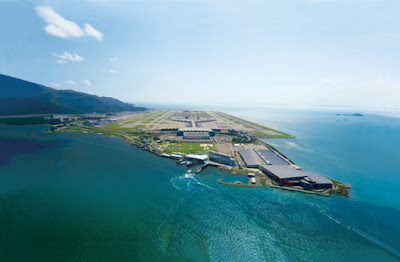 Airports, in similar vein, use IT applications such as Cloud Computing; Big Data; and the Internet of Things for connectivity and making efficient their information flows. Airports are also tremendously benefitted by the use of IT – in particular Artificial Intelligence (AI) - in developing deep learning algorithms for risk-based assessment of threats posed by potentially dangerous goods and substances. Kevin Riordan, Head of Airports and Checkpoint Solutions at Smiths Detection says: “[T]he application of deep learning algorithms for automated threat detection requires the availability of a considerable image database, categorized in threats and unsuspicious images. Deep learning algorithms scan this information to learn which objects are potentially harmful and which are benign”. One must also not forget that in this chain of the aviation industry, there is also the air navigation services industry which provides air traffic control. This industry now relies heavily on information and communications technology for efficient and timely communications integration and management and quick decision making. At the core of the approach by both airlines and airports in their reliance on IT is their relentless focus on the passenger, which is reflected in New Experience in Travel Technologies (NEXIT) – a joint programme developed by the two global associations representing the air transport industry and the airport industry – namely the International Air Transport Association (IATA) and Airports Council International (ACI). This programme is a direct response by these two associations to the steadily rising passenger numbers. Sarah Samuel, Head of Airport IT for Asia-Pacific at Amadeus says: “…the programme highlights the need for airports to focus on how the latest in digital technology can create a seamless flow through the airport and help to integrate systems and services”. Of major importance to this (IT) megatrend in aviation is the statement by Angela Gittens, Director General of ACI, which effectively binds all the elements in the equation when she says: “We (ACI) take an evidence and data-based approach to provide a voice for the world’s airports in the formulation of regulation, policies, standards and practices”. The key words here are “regulation, policies, standards and practices”. In other words, the data-based approach adopted by all three industries – airlines; airports; and air traffic control services, must inevitably be accompanied by laws and regulations. The corollary to any human practice or endeavour is the ominous possibility of things going wrong, and this potential risk must be taken into account when considering the promulgation of regulations or the adoption of standards and recommended practices. Harvard Business Review cites three possible concerns where humans would not comprehend how a machine reached a conclusion. They are: hidden biases cultivated by the machine through the learning process; since machines are mostly neural networks that work with statistical data, it would be difficult to think that the solutions given by a machine would work in every case, particularly where there are variables and random circumstances; and when a machine error occurs, it would be difficult to correct the error for the first concern cited – that humans may not understand how the machine came to its conclusion. Max Tegmark, Professor of Physics at the Massachusetts Institute of Technology in his book Life 3.0: Being Human in the Age of Artificial Intelligence offers the following principles: the goal of AI should be to create not undirected intelligence but creative and beneficial intelligence; investments in AI should be accompanied by funding for research on ensuring its beneficial use, including thorny questions in computer science, economics, law, ethics and social studies; there should be healthy and constructive exchange between AI researchers and policy makers; a culture of cooperation, trust and transparency should be fostered among researchers and developers of AI; and teams developing AI systems should actively cooperate to avoid corner-cutting on safety standards. Against this scenario, it would be advisable to evaluate the most prudent approach to the use of AI. While AI is proving to be an asset to human progress, with such innovations as Amazon’s Alexa and Google’s self driving cars, it could be several decades before AI attains complete fruition, as discussed above, as a total replacement of biological intelligence. Thomas W. Malone, in his book Superminds suggests using AI in combination with human intelligence where a collective intelligence could better serve humanity. Malone suggests hypoconnectivity between the 7.2 billion people of the world as the most important tool for the 21st century, where the optimal use of information technology could be a supplement to human intelligence in connecting the world. The fact that airlines, airports and air traffic management are using information and communications technology in the advancement of their activities and in coping with the exponential rise in demand for air transport leaves no room for doubt that they are on the right track. However, they must not disregard the fact that law and regulation are key elements in managing data flows and ensuring that whatever the buzzwords might be in modern technology and science, and however much they would facilitate the functioning of a rapidly changing world, they must be properly regulated.